* Stop #5 of my Burger Love adventure. Burger goodness continued with the "Sugar Daddy" from 511 West. 7oz. 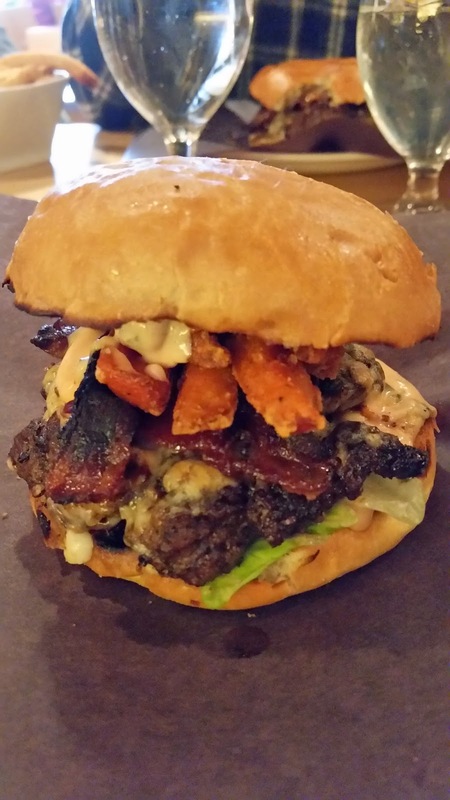 Island Beef Chuck with peppercorn crust, housemade 1000 Islands dressing, leaf lettuce, jalapeno monterey jack cheese, maple chili candied thick cut bacon, housemade quick dill pickles, grilled red onion dressed with honey & balsamic, and sweet potato fries on a buttered and grilled brioche bun. Right from the first bite I knew this one would climb to the top of my list. So many great flavours that went together perfectly. The thick juicy burger was cooked to perfection, the jalapeno cheese melted on top added just a little bit of heat but it was offset perfectly by the candied bacon which was delicious. The sweet potato fries were a nice touch and went well with the dressing. Chef Emily knocked it out of the park with this one. It's worth the drive to Summerside to check this one out, you won't be disappointed.